OSDD is a CSIR-led Team India consortium with a global partnership. Its vision is to provide affordable healthcare to the developing world by providing a global platform where the best minds can collaborate & collectively endeavor to solve the complex problems associated with discovering novel therapies for neglected tropical diseases like malaria, tuberculosis, leishmaniasis, etc. It is a concept to collaboratively aggregate the biological and genetic information available to scientists in order to hasten the discovery of drugs. This will provide a unique opportunity for scientists, doctors, technocrats, students and others with diverse expertise to work for a common cause. OSDD is a community of students, scientists, researchers, academicians, institutions, corporations and anyone who is committed to discovery of drugs in an open source mode. Open source drug discovery emphasizes integrative science through collaboration, open sharing and taking up multifaceted approaches and getting the benefits from advances on different fronts of new drug discovery. 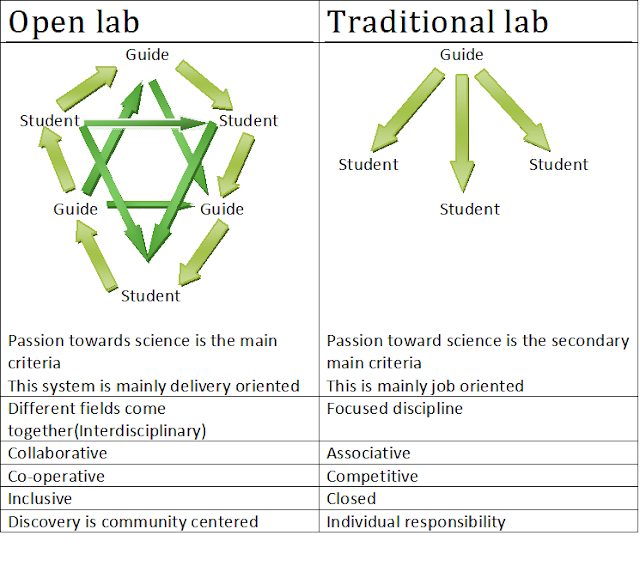 What is an open lab? OpenLab is a new research initiative for interdisciplinary and collaborative projects and it is a public private partnership where people from different sectors can contribute for a common cause. It allows knowledge sharing and brings different minds to work together. Any enthusiastic scientist/research fellow can work for a noble cause wherein the interested person can avail all the required facilities to contribute towards the work. In-silico work would be supported with the provision of tools and softwares that would help in a particular project. An open lab will help pooling in new ideas and working for the same. It gives an opportunity for a research fanatic to apply and implement his ideas with the available resources. Individual talent can be motivated through an open lab system and drive the idea further. Development of a web-based portal for data deposition, exchange, evaluation and tabulation for analysis. 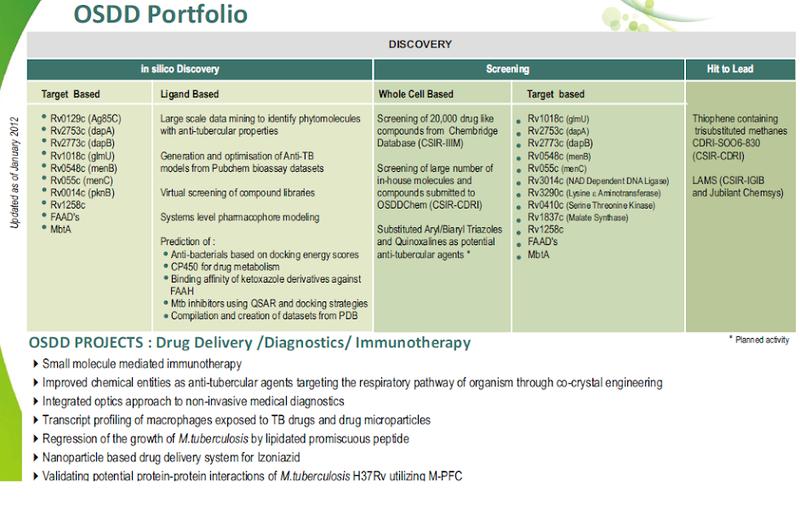 To create a comprehensive System Biology approach for drug discovery. Human resource development with emphasis on encouraging young minds. Intellectual property protection to the extent its support public good. Academia-industry partnership i.e., Public-Private Partnership (PPP) in open source mode. To establish an International Collaborative Centre for Affordable Health (ICCAH), which will operate with Government, International and Philanthropic funding. OSDD is a CSIR Team India Consortium with Global Partnership with a vision to provide affordable healthcare to the developing world by providing a global platform where the best minds can collaborate & collectively endeavor to solve the complex problems associated with discovering novel therapies for neglected tropical diseases like Malaria, Tuberculosis, Leshmaniasis, etc. It is a concept to collaboratively aggregate the biological and genetic information available to scientists in order to use it to hasten the discovery of drugs. This will provide a unique opportunity for scientists, doctors, technocrats, students and others with diverse expertise to work for a common cause. OSDD. Picture Window theme. Theme images by konradlew. Powered by Blogger.